I have been teaching jewelry courses for the past seven years. 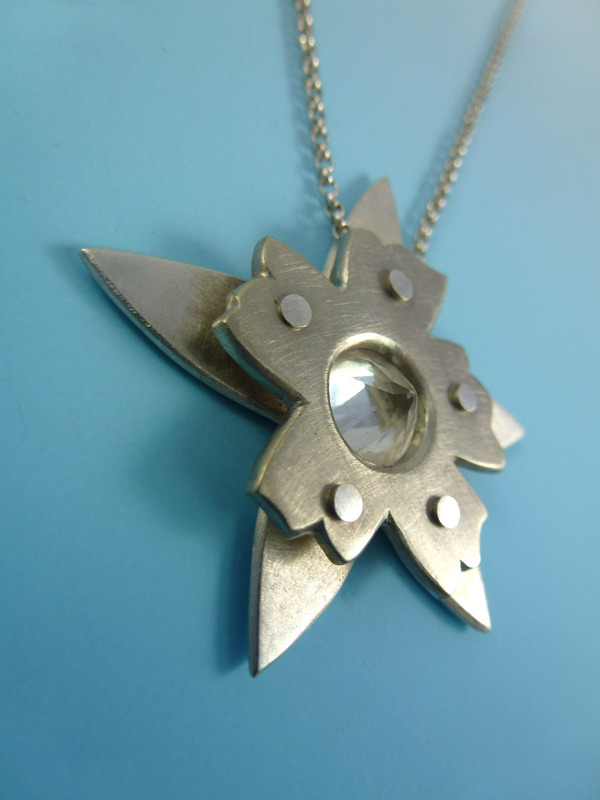 I have taught beginning through advanced jewelry making courses as well as weekend workshops. Teaching has driven me to continually learn new techniques to keep my classes current and engaging. In the end, teaching has become a way to share my knowledge with the community as others have so generously shared with me. I currently teach jewelry courses and workshops through Whaley Studios in Hillcrest, San Diego. I have an upcoming Keum-Boo workshop that I will be teaching through Whaley Studios. Click on the link below for more details. 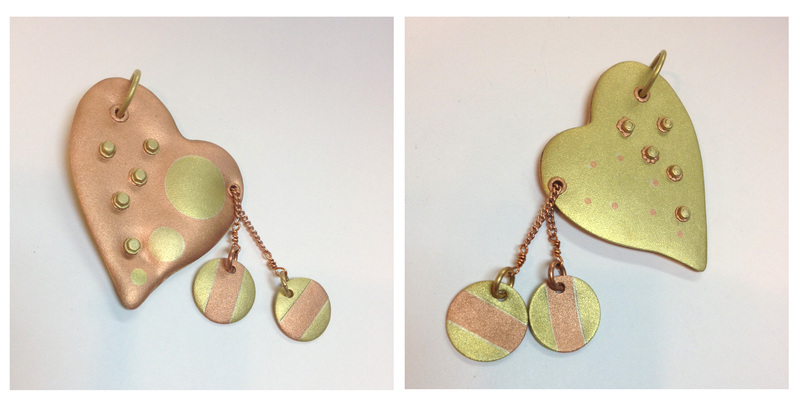 Sample of earrings with Keum-Boo. Keum-Boo is a Korean technique of fusing pure gold onto silver. 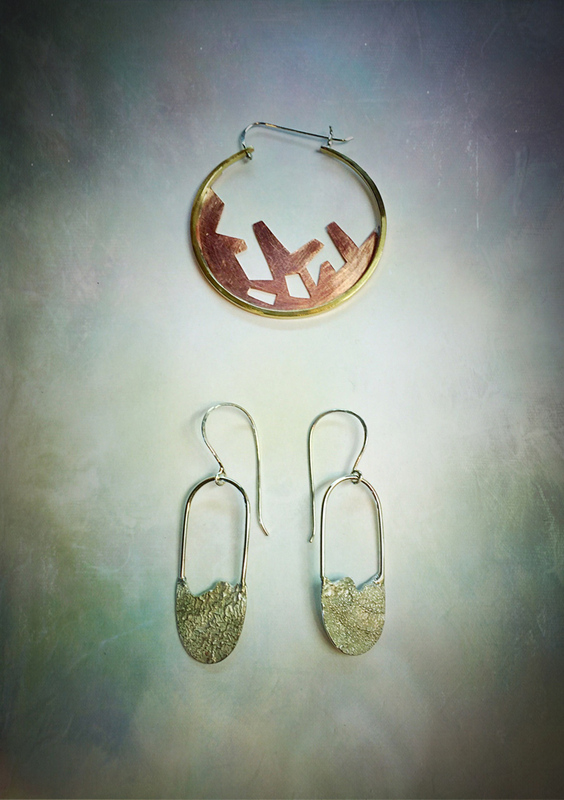 Below, are images of samples of jewelry techniques I create for class as well as exemplary student work. 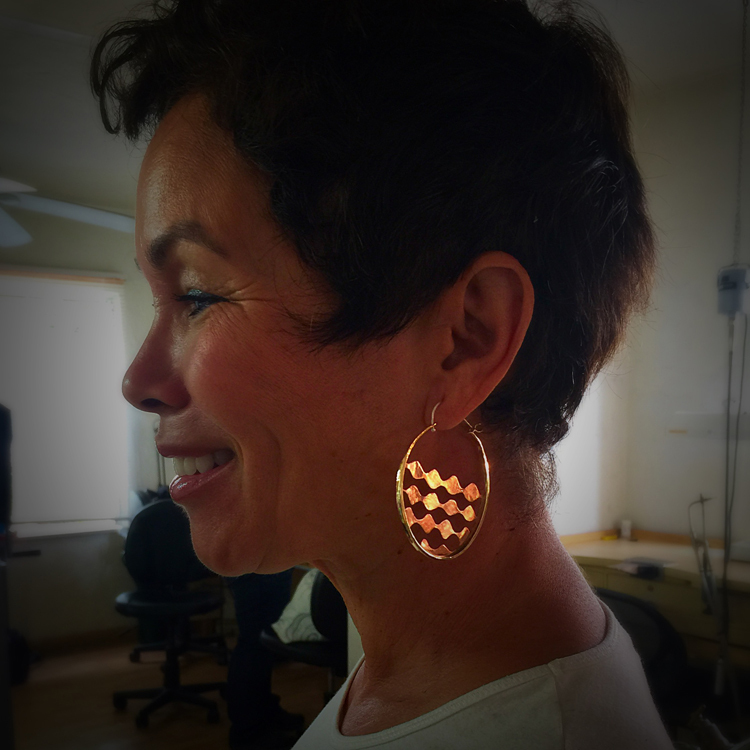 I taught a workshop on how to fabricate the popular hoop earring. Various closing mechanisms and forming techniques were covered in this workshop. This is a great technique for incorporating a variety of subtle colors into metalwork. I have taught this class both at Whaley Studios and the former UCSD Crafts Center. Below is a finished sample demonstration for marriage of metals. 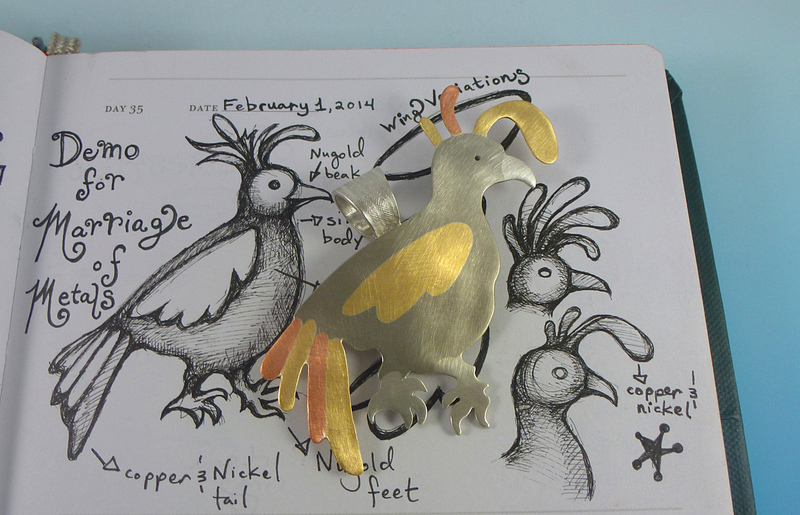 This is a quail sample I fabricated out of nickel, sterling silver, brass and copper. 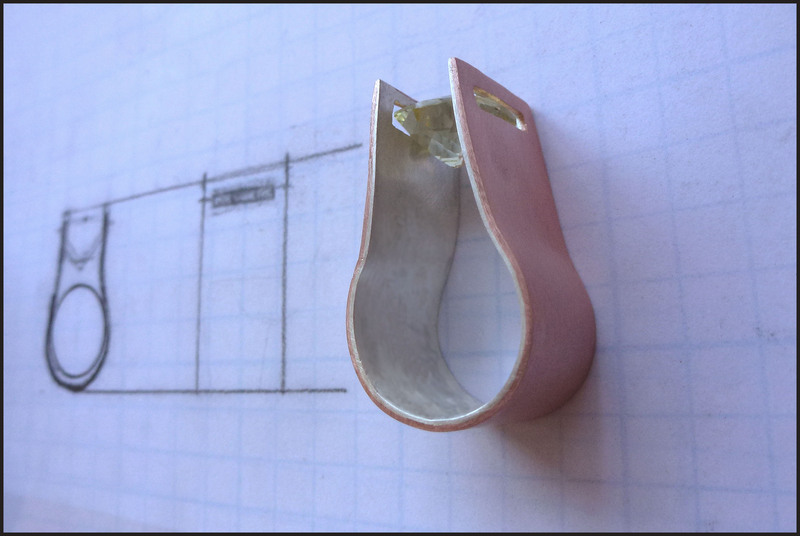 I also included my sketching process for planning out my metal inlay demonstration. 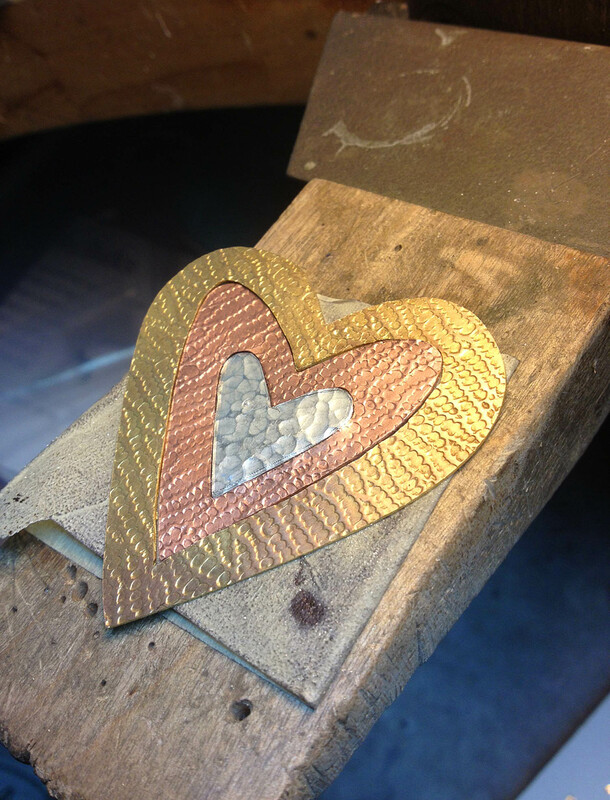 This is a heart pendant in progress made by Lindy Hartig. 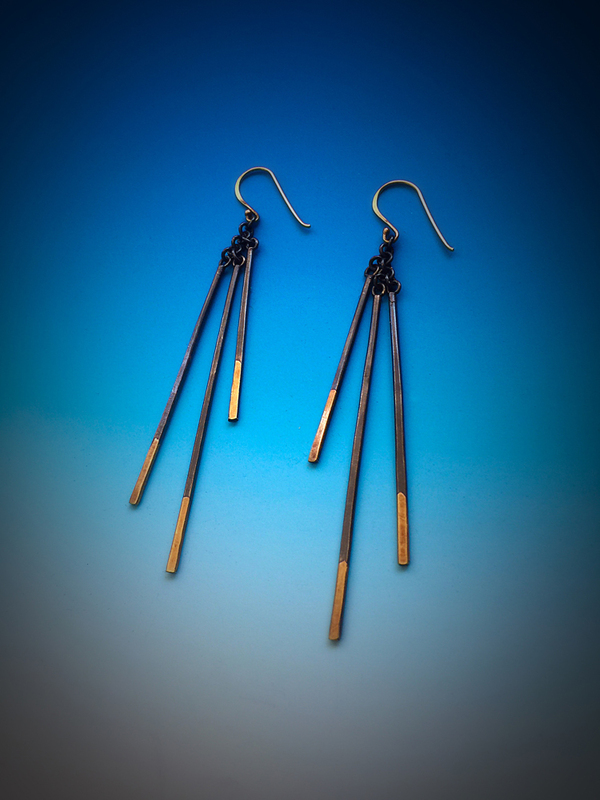 Her piece is made of sterling silver, brass and copper. 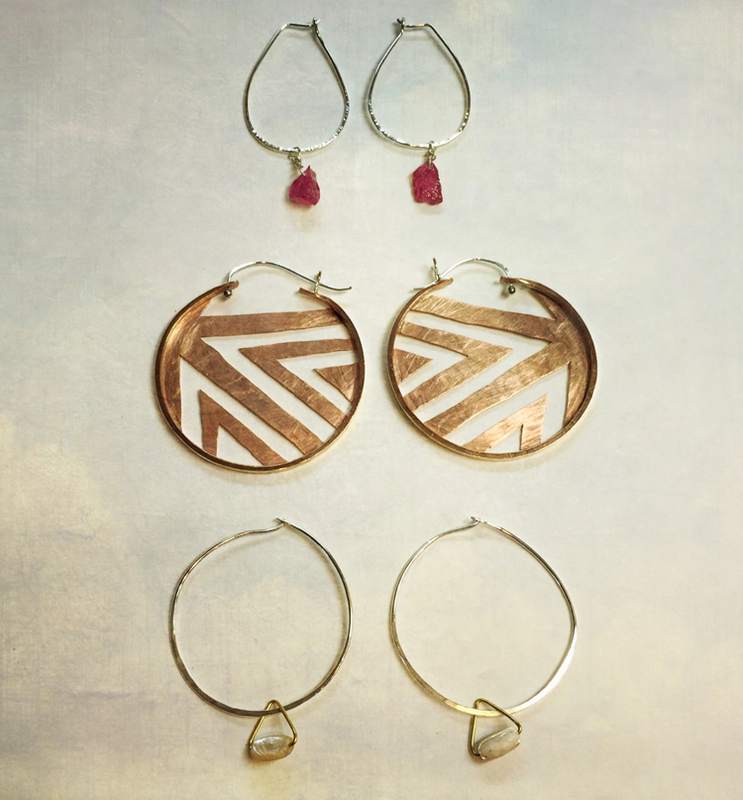 She textured each of the various metals for a more enhanced look. This sandblasted heart pendant was made by Anne Evanson. She incorporated stripe inlay and polka dot inlay techniques in her project. This modern take on a treble clef was made by Nicki Carano. 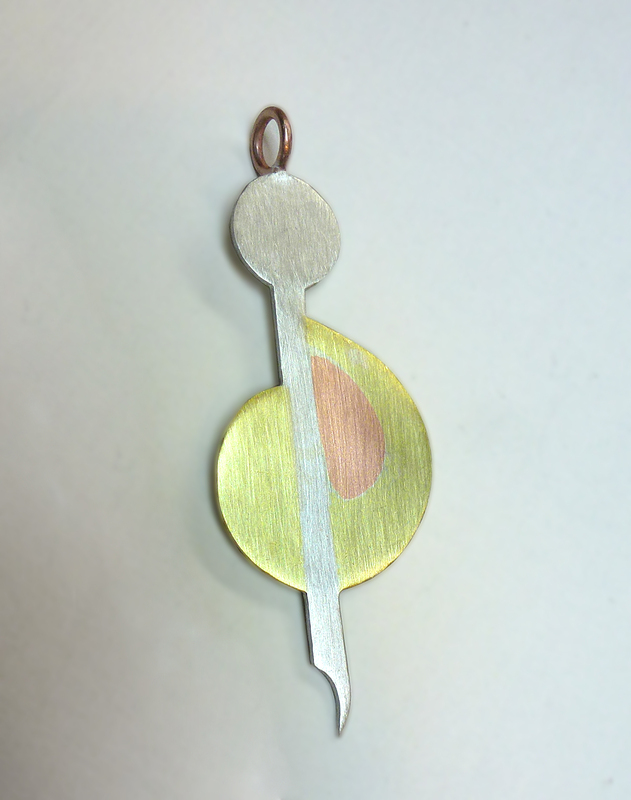 She made her pendant out of sterling silver, copper and brass. I have taught several creative stone setting classes demonstrating a variety of alternative setting techniques. Below are sample demonstrations for riveted overlay. This a riveted overlay setting incorporating a faceted quartz stone that is back-set. I used nickel and sterling silver in this piece. 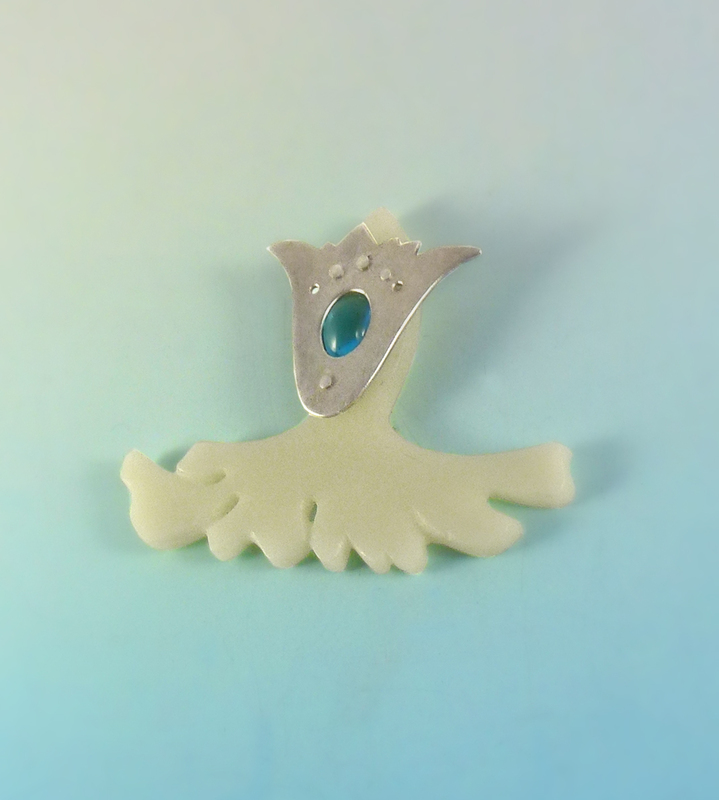 This riveted overlay sample incorporates a blue topaz cabochon and acrylic plastic. Riveted overlay setting is an excellent technique for incorporating alternative materials because the piece is entirely cold-connected. This is an example of riveted overlay made by student, Stephanie Grum. This piece was featured in “100 Links by 100 Artists” jewelry project. 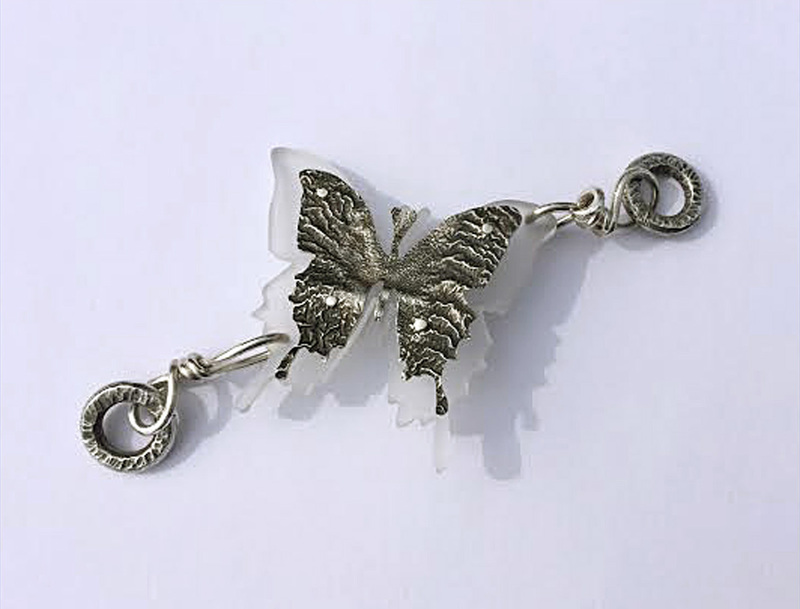 Stephanie made this piece out of sterling silver, reticulated silver and acrylic plastic. This is another riveted overlay example made by student, Jackie Hall. 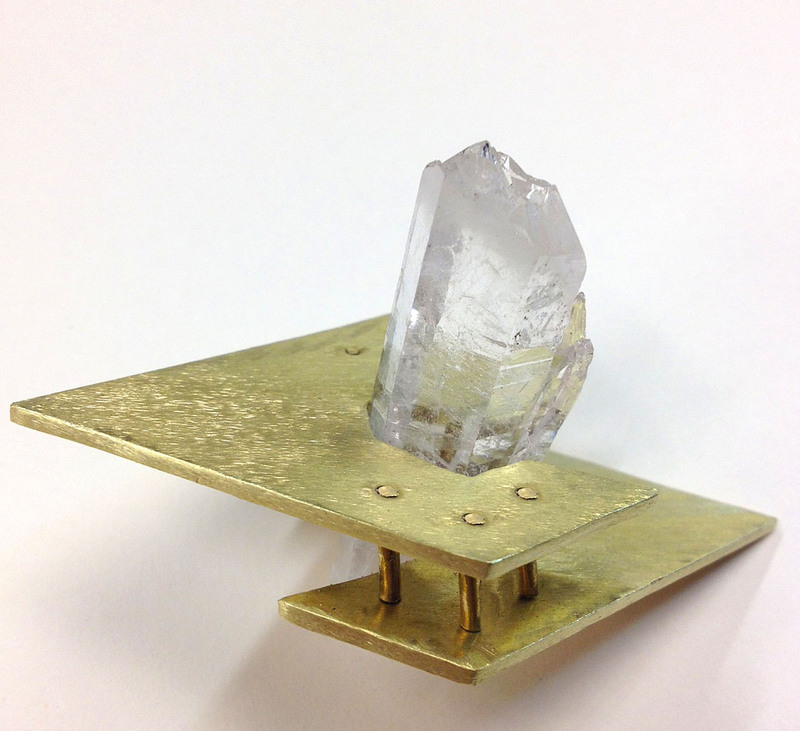 She fabricated this piece out of brass and quartz crystal. Tension setting is setting technique that traps the stone between work-hardened metal. Because the stone is being held at two points, the stone appears to be “floating”. Tension setting’s minimalism gives jewelry a clean, modern aesthetic. Below are my sample demonstrations of this technique. These tension set rings are made of sterling silver, cubic zirconia and tourmaline. These samples I made are classic examples of tension setting. 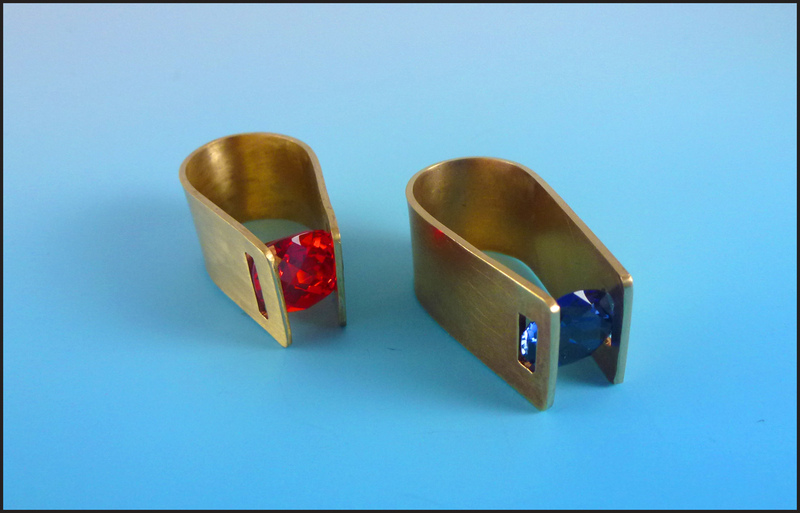 This tension set ring is made by student, Michele Murphy. 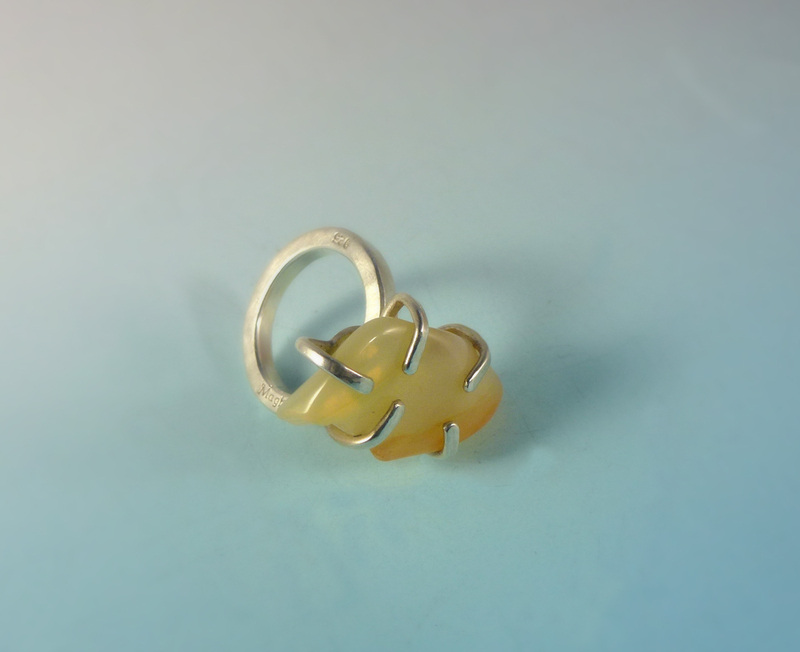 She fabricated this ring out of sterling silver, copper and lemon quartz. Next to her ring is a rendering planning out the construction of her piece. 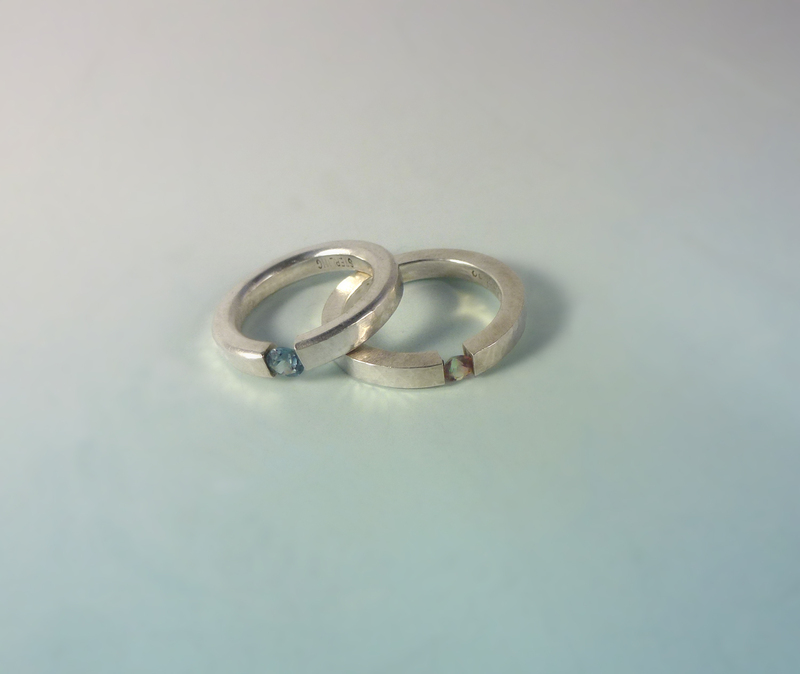 These tension set rings are also made by student, Michele Murphy. She fabricated them out of cubic zirconia and nugold. Modified Prong is a type of stone setting that is ideal for irregular stones. Stones that would normally difficult to set using traditional jewelry setting techniques work especially well for this technique. This is a sample that I made demonstrating the modified prong technique. This ring is made of agate and sterling silver. This is an example of modified prong setting made by student, Brighid Lambert. 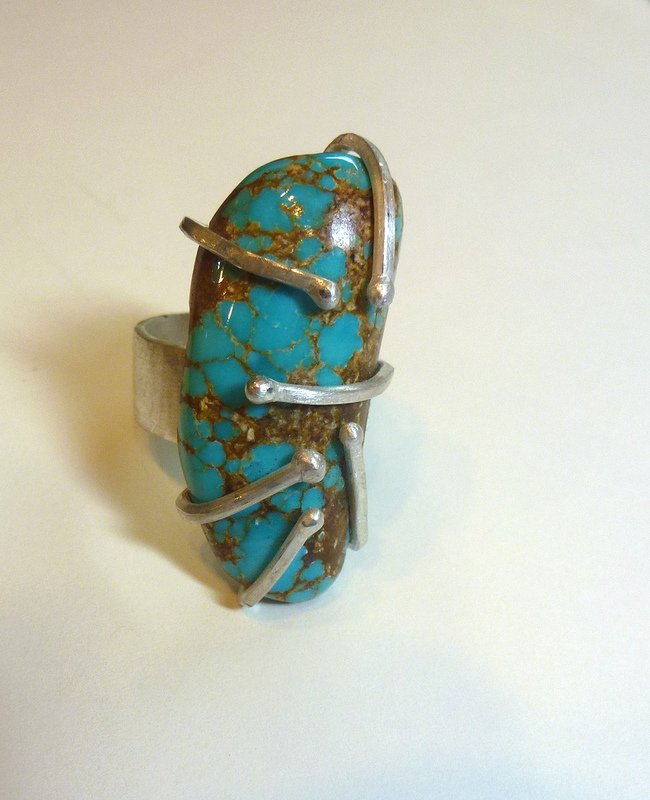 She fabricated this ring out of sterling silver and turquoise. These two pendants utilize modified prong settings. 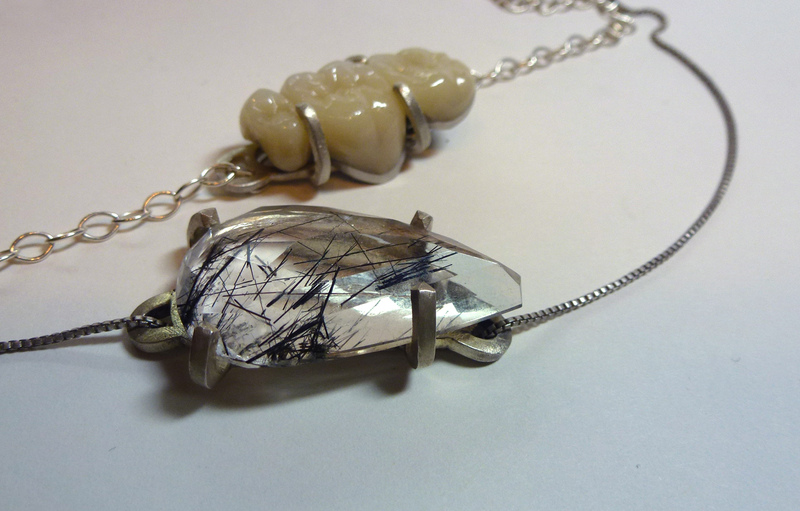 These pendants are made of sterling silver, rutilated quartz and porcelain teeth by student, Erika Murillo.